Conditions:Excludes Gift Cards, multibuys, Mega Buy items, Flash Deals or any other special offer. Conditions:Excludes Mega Buys, Multi-Buys and Gift Cards. Just got a £90 coat half price and then 15% off. Thanks to OP for posting. Shame the deal had been expired too early on here. Excludes Mega Buys, Multi-Buys, Gift Cards, Garmin, Suunto, GoPro, Tom Tom, Biolite or Polar products. Blacks price matched the sale price + the 20% in store, and gave an additional 15% for military discount. Bagged an Osprey Atmos 65 (RRP £190) for £116.28, and a Terra Nova Laser Competition (RRP £425) for £202.30. Don’t ask, don’t get! Not site wide. The offer only applies to Peter Storm, Technicals, Brasher, Eurohike, Regatta, Sprayway, One Earth, Columbia and Berghaus Camping branded items. Looks to be only on limited items. Gave me an error when I tried. Would probably bring the price down to what it should be. Millets I found are expensive. An Extra 25% Off The North Face USE CODE: HALFDOME Extra 15% BANK15 Enter the code at the checkout. I ordered a tent from Millets twice, the2nd time they confirmed with the warehouse they actually had it in stock and both times they were unable to fulfill my order. It was very frustrating and a good job I didn’t buy accessories for the imaginary tent they kept on re advertising online. Very poor customer service, read the reviews and avoid is my advice. Enter the code at the checkout to get 20% off Full Priced North Face. 50% off selected camping gear some great tents half price ! This could be the winter of our discount tent. How does this work, half a tent, half a sleeping bag...? Go to Millets' online store at www.millets.co.uk. After completing your online shopping, review your orders in your shopping basket. 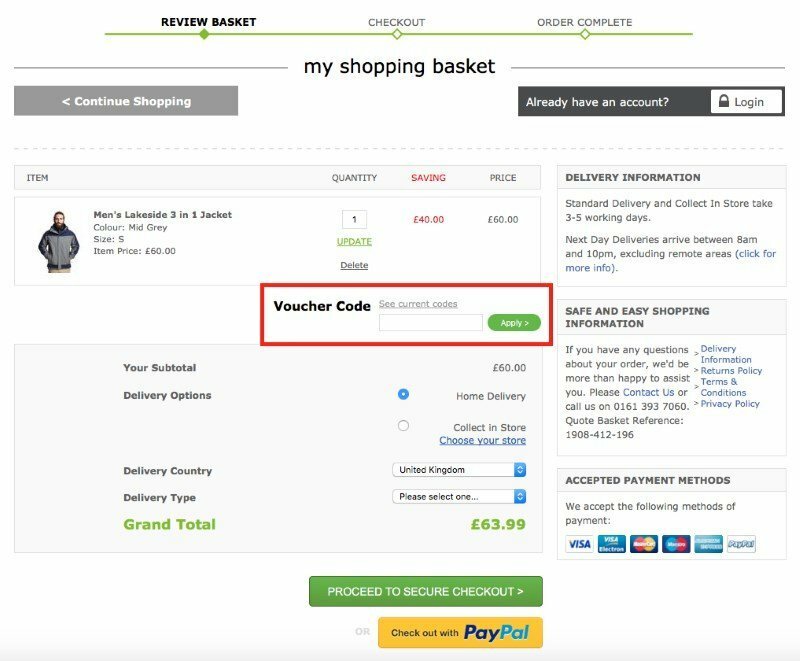 Enter your discount code in the box marked “Voucher Code”. The page will then refresh to show the new price. Make your purchase in the regular way. Millets sells gift cards in various denominations up to a maximum of £200 in their online shop. These can be used in participating stores in the mainland UK, Northern Ireland and the Channel Islands. Millets gift cards are valid at JD, Scotts, Blacks, Millets, Tessuti, Ultimate Outdoors and JD Pro outlets. However they cannot be used at the online store. Millets gift cards are valid for 12 months from the date of purchase. Find our more at.